As we think about what we have to be thankful for this holiday season, we should remember that millions of Americans can’t afford two of the most basic necessities: adequate food and shelter. Food insecurity. Some 15.8 million households with roughly 42 million people were “food insecure” last year, meaning someone in the household had inadequate access to food at some point during the year. In most of these households with children, only the adults were food insecure because adults often devote their limited food resources to their children. Still, 3 million households last year included children who were food insecure at times. Some 6.3 million households containing over 14 million people had “very low food security” last year — a more severe form of food insecurity in which household members have to take steps such as skipping meals because they lack resources. 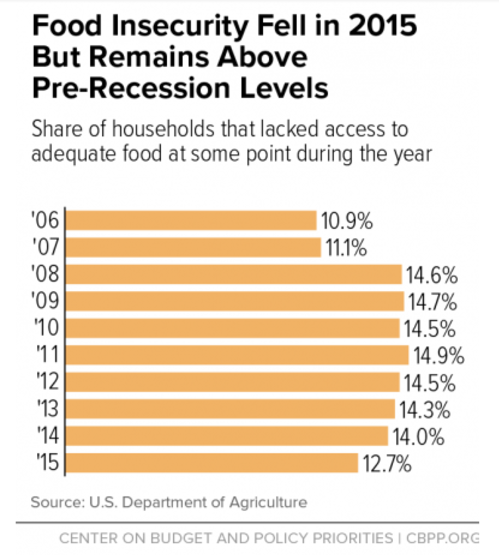 The share of households that are food insecure — and the share with very low food security — fell last year but remain above pre-recession levels (see graph). Homelessness. Some 1.5 million people spent at least part of 2015 in a homeless shelter. Over 450,000 of them had disabilities, over 120,000 were veterans, and over 300,000 were children. In fact, children under age 5 are at greater risk of homelessness than people at any other age. Moreover, shelter use is only the tip of the iceberg; housing insecurity is much more prevalent among poor families with children than the homelessness data alone indicate. The families of more than 1 million school-aged children are living doubled up with other families, in hotels or motels, or on the street, Education Department data show. Research consistently links homelessness and housing insecurity to a range of adverse outcomes for children that have long-term consequences, including increased risk of cognitive, mental health, and behavioral problems, physical health problems such as asthma, and poor school performance. The importance of the safety net. The figures cited here would be far higher if not for key safety net programs such as SNAP (formerly food stamps) and Housing Choice Vouchers. SNAP helps millions of households afford adequate food — for example, food insecurity among children falls by roughly a third after their families receive SNAP benefits for six months. Housing vouchers targeted to veterans have helped cut veteran homelessness in half, and a major recent study found that vouchers are the most effective tool for families seeking to escape homelessness and raise their children in safe, stable homes.